In Chichen Itza, rows among rows of vendors setup throughout the day to sell Mayan handicrafts including wood sculptures of black jaguars, mini Chichen Itza pyramids, musical instruments, etc. If you see something here, bargain it down 1/3 to ½ of the price. Don’t pay more than 1/2 . Best to offer 1/3 and walk away if you don’t receive a counteroffer to what you think is acceptable. Given that there are so many people selling the same items, you’ll most likely receive a deal. Also, buy it at Chichen Itza if you see it. We had wanted to purchase some turtle/crocodile shaped musical flutes made of clay but didn’t receive the bargain we were looking for. However, back in Cancun we couldn’t find them at all. So remember, if you like it, bargain and buy it. I didn’t look too hard for the vanilla beans, but found them at the Duty Free shop at the Airport, which sold them 3 sticks for $7 or 5 sticks for $12. Relatively good price for quality vanilla beans. However, I would also recommend looking at Walmart or Costco in Cancun if you have time. 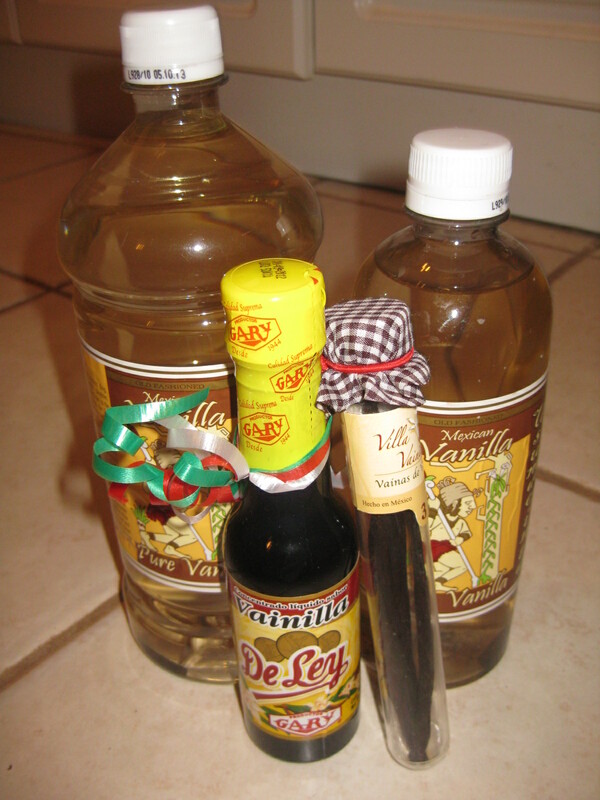 Vanilla (liquid form), I found cheapest and best quality at Walmart in El Centro (Downtown Cancun). I was able to get 1L of white vanilla (not the regular brown vanilla, but pure white) with a floating vanilla bean in it for just over 900 pesos, which works to be under $9CAD/USD. They also have them in smaller sizes at Walmart. Note: make sure that vanilla bean is listed first on the list of ingredients and not water. The order should be vanilla bean, alcohol, and water for the purest form; however most found were vanilla bean, water, and alcohol. Do not buy the vanilla from the airport or your hotel might have some. You will think it’s cheap but they usually list water as their first and primary ingredient. 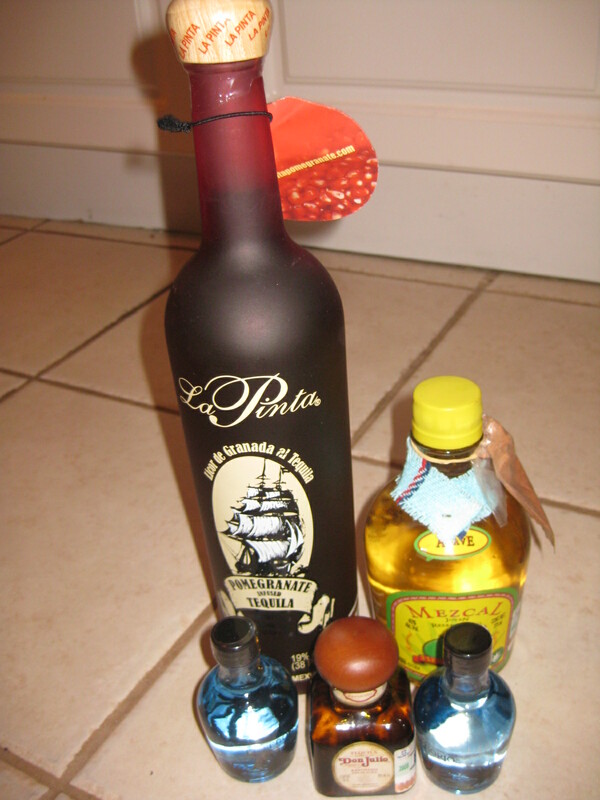 La Europea on the Hotel Zone sells a large selection of tequila and other liquors. The prices are comparable to Duty Free. Walmart also sells alcohol at a lower price. However, due to airline regulations you will need to pack that in your checked luggage. To avoid this hassle, you can just purchase your alcohol at the Duty Free at the Cancun International airport. The first Duty Free you see when you cross customs has the biggest selection. They even have salespeople making recommendations and allowing sampling. Most likely whatever you are looking for, they will have it. The prices are equal or comparable to La Europea. Although Canadians can travel to Cuba and purchase Cuban cigars, Mexico also sells Cuban cigars throughout for U.S. travellers in particular who cannot find them elsewhere. Cubans can be purchased at the Duty Free shops at the airport, however for the best and cheapest selections go to Walmart or even the local markets in Cancun or on Isla Mujeres. Bargaining will probably get you a better deal. Do some research online and know what your bottom cost will be when bargaining. We found very cheap ponchos and blankets in two locations: Chichen Itza and Ki Huic market (the oldest market in El Centro along Ave Tulum). My friend purchased a large mixed wool/cotton blanket for 180 pesos at Chichen Itza even though the asking price was around 400 pesos. I purchased a mixed wool poncho for 100 pesos at the Kiel Hic market even though the seller originally was asking for 450 for the poncho. However, the style of poncho I purchased was not available at Mercado/Market 28, so again if you see something you like, bargain and buy it. Don’t wait. Wherever you see the items however, ensure you ask what it is made of and feel the texture. The best quality is 100% wool, however you will be asked to pay a lot more for 100% wool. Otherwise mixed wool and cotton is quite a good quality as well. Make sure not to buy 100% cotton or acrylic as they would be really cheap otherwise. Walmart also sells mixed wool/cotton blankets if you do not want to go through the hassle of bargaining. Those blankets will cost you around 370-390 pesos. Mexico is famous for its silver jewelery. However, be careful of scams. Many jewelers at the markets will try to sell silver as silver plated or stainless steel. Make sure that whatever the piece of jewelery it has stamped somewhere .925 or .950. These are the number symbols that indicate it’s silver. Also silver will be sold at the markets by weight. Make sure to bargain at the markets because they always market it up quite high. Also, look at your hotel for unique pieces as some hotels sell custom made jewelery that aren’t readily available at the markets. I also found some silver jewelery stores with special custom designs in Valladolid, on the way back from Chichen Itza. San Roman is a jewelery shop in Valladolid that specializes in unique, modern designs. However, Mercado 28 has more silver shops but I’ve read reviews from other people about scams at Mercado 28 on Tripadvisor. At the airport, you can also find silver jewelery at affordable prices. I purchased a ring for $12 USD and was sterling silver. Also, the exchange rate at the airport is higher at 12.3 pesos per USD, so makes it more reasonable to purchase it at the airport. Mercado 28 and Ki Huic in El Centro Cancun have very cheap souvenirs. Try not to buy from your hotel if you can venture out to those two markets. Mercado 28 has a couple of shops that don’t bargain but have great deals already marked on their items. I was able to purchase 10 items for 100 pesos an assortment of self-picked magnets, shot glasses, wooden flutes, keychains, etc. If you are paying more than 10 pesos for a magnet or shotglass, it better be very unique, otherwise you have paid too much. Even my hotel had magnets and shotglasses for $1 USD which was still cheaper than what the starting price some market vendors were charging. Price compare at Mercado 28 as most stores sell the same items. At Chichen Itza you have to bargain, but sometimes you will be able to find a good deal such as 2 magnets for 30 pesos even though they asked for 40 pesos for 2. Most Chichen Itza souvenirs are only sold at Chichen Itza. On Isla Mujeres, bargain deals can be found in the hidden Artesanias Market at Avs Matamoros and Arq. Carlos Lazo. However, along the row of vendors outside of the ferry terminal, you can also find some good deals that you can pick up that say “Isla Mujeres”. Note: once you leave Isla Mujeres, you will not be able to find Isla Mujeres labelled items as easily in Cancun. All else fails, Walmart is your friend for cheap souvenirs. They had cheaper postcards than at Mercado 28. Walmart postcards were 3 – 4 pesos each, however Mercado 28 was asking 6 pesos for a postcard. 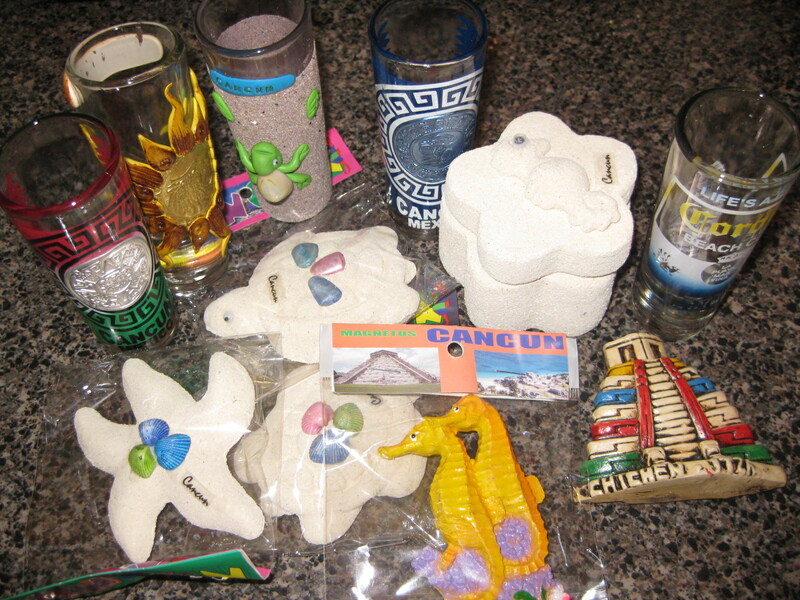 A tip for shopping before you go out and search for your Cancun goodies: make a visit to your hotel souvenir shop to see what items are priced at and quality of items. That way you have a starting knowledge of prices. Chances are your hotel has already marked up their goods at least double, if not triple the price from the markets, street vendors or even Walmart. « Clubbing the Coco Bongo way in Cancun!